Narrabri, NSW is a rural town of about 8000 people located on the Newell Highway approximately 560 kilometres north west of Sydney. It is a farming region well known for its cotton and grain crops. It may not be the first place that people think of visiting, but as we discovered, this area has a lot to offer visitors. When you visit Narrabri, you should make the Narrabri Shire Visitor Information Centre your first stop. As with most Information Centres we’ve been to, the staff were friendly, knowledgeable and helpful. 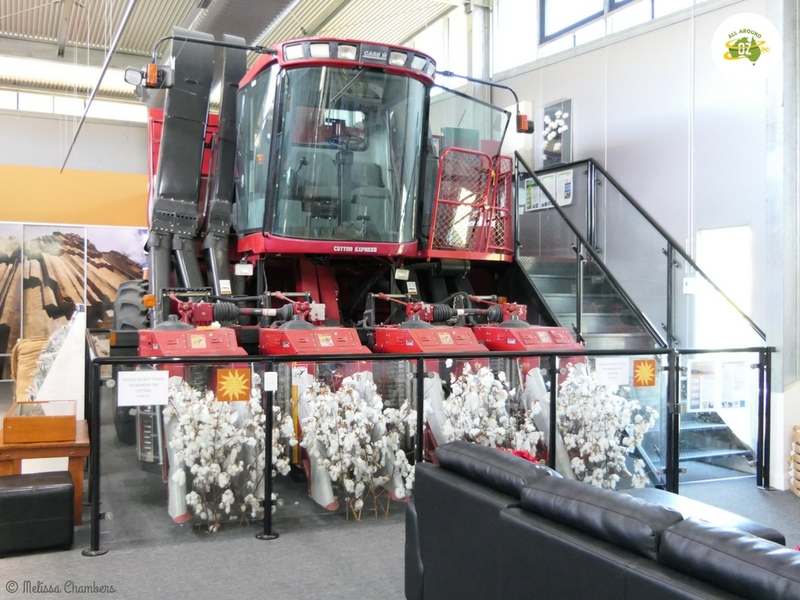 But what really impressed me was the fact that they have a full-sized cotton harvester on display. These machines are huge and have four large ‘forks’ on the front that harvest the cotton by stripping the cotton off the plant. Being able to climb up into the cabin gives you an idea of what it takes to operate these massive machines. A full size cotton picking machine dominates the Narrabri Visitors Centre. Narrabri was named the ‘Sportiest Town in Australia’ in a television contest back in 2001. 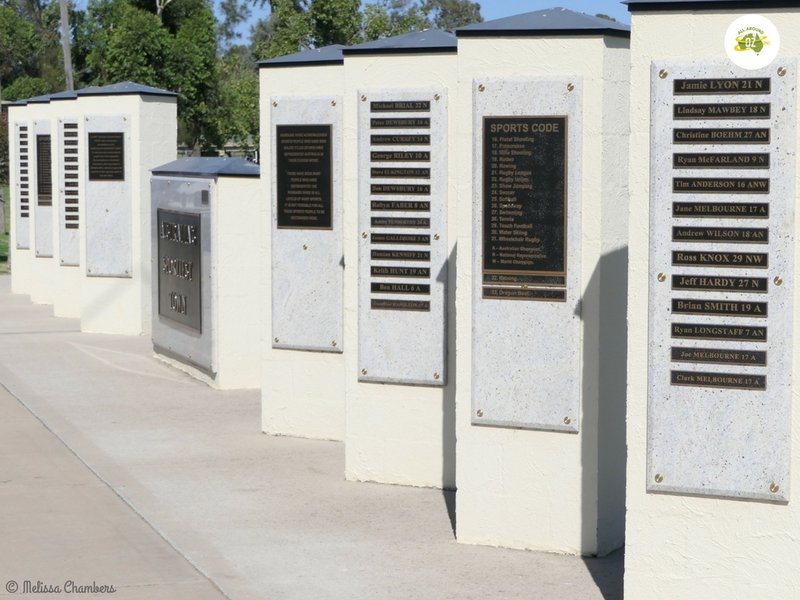 A monument wall listing all the sports men and women who have hailed from Narrabri and gone on to compete in their chosen sports both on a national and international level sits overlooking the sports fields. As can be expected these fields are immaculately kept. Narrabri won the title of Australia’s Sportiest Town and built a nice memorial to all their sportsmen and women. Narrabri is an old town having been established in the 1800’s. Examples of early buildings can be seen in the original Court House built in 1865, the ‘new’ Court House, built in 1888, the Masons Lodge, 1892 and Faulkner’s Factory which dates back to 1891. Also of interest in Narrabri is the Old Gaol Heritage Centre Museum. The former Gaol opened in 1882 and closed in 1982. It could accommodate up to 49 prisoners, both male and female. It now houses a collection of items including war memorabilia, women’s apparel and household items. One cell has been left in the same condition as it was when the Gaol closed in 1982. Located 25 kilometres west of Narrabri the Compact Array is six, 22 metre parabolic dishes used for radio astronomy. Opened in 1988, the Compact Array only receives signals from space. It never sends them. The six dishes are able to be moved along railway type tracks. Different distances between each dish produces better radio pictures. The Visitors Centre at the Compact Array has a small informational display and a viewing platform at the front. Entry to the Centre is free, however there are no staff on hand to answer questions. Picnic facilities and toilets are provided. 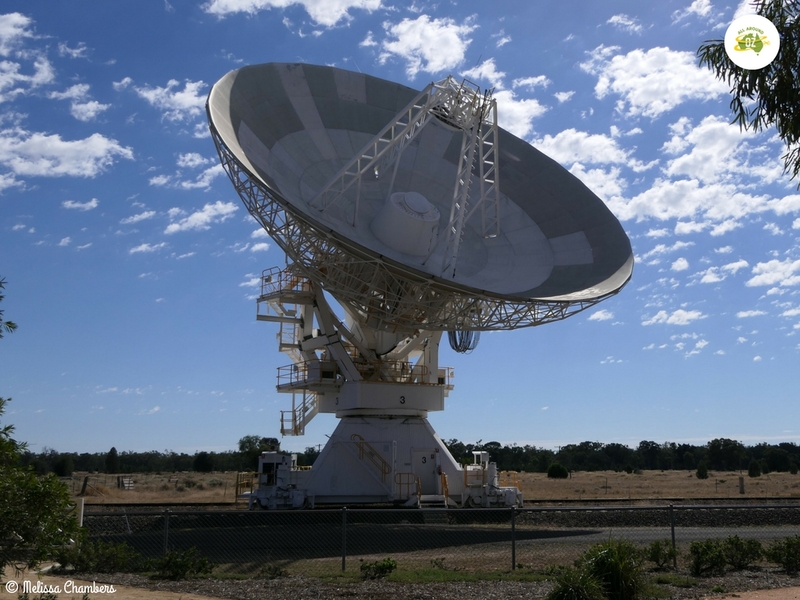 The CSIRO Compact Array Telescope is a set of six telescopes used for radio astronomy. Mount Kaputar National Park is located about 50 kilometres east of Narrabri and covers an area of approximately 370 square kilometres. There are numerous camp sites, walking trails and picnic areas located throughout the park. But without doubt the most spectacular spot is Sawn Rocks. Situated at the northern end of the park, Sawn Rocks is a truly special sight. It is a geological formation known as organ-piping and it’s not hard to see where it gets its name from. Sawn Rocks is an easy 750 metre walk from the carpark along a boardwalk. I found the light in the middle of the afternoon to be the best time to view the rock formations. 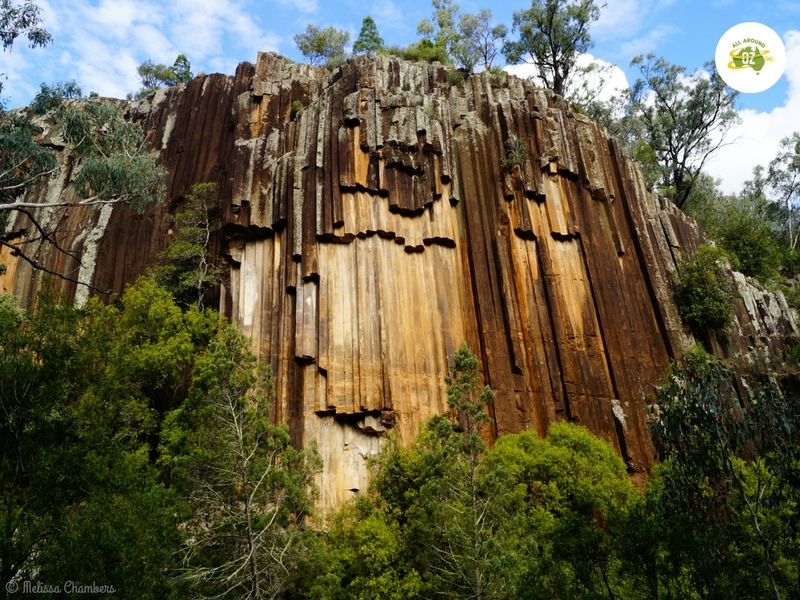 The stunning colours and formations of Sawn Rocks in Mount Kaputar National Park. There are plenty of accommodation options in and around Narrabri. There are several motels, a couple of B & B’s and three caravan parks. Plus you can stay at the showground or camp in the Mount Kaputar National Park. But for me, you can’t go past Yarrie Lake. Just 30 kilometres from Narrabri the camp ground sits on the edge of a lake that was believed to be formed by a falling meteor. It is quiet and peaceful and just about as perfect as it can get. An un-powered site will set you back just $15.00. Showers and toilets are available and as an added bonus you can have a camp fire. 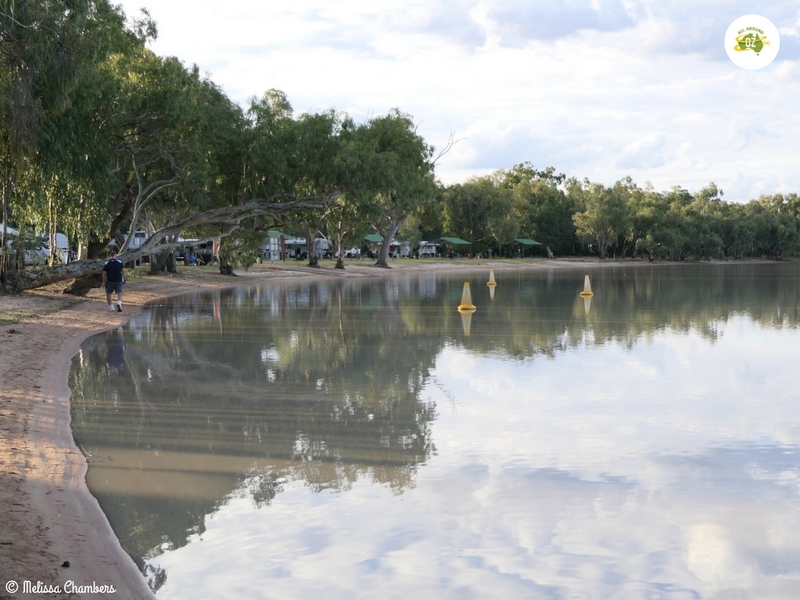 Yarrie Lake is a quiet, peaceful spot to camp near Narrabri. Gorgeous, I’m hoping to get out that way soon and will use this list. Thank you. You’re most welcome Seana. The whole areas a bit of an unexpected gem!